With the passage of Proposition 1 in November of 2014, voters approved $7.5 billion for a variety of water projects and programs, with $2.7 billion of that set aside to pay for public benefits of water storage projects. The California Water Commission is the state agency tasked with allocating the money among eligible projects, and over one year since passage of the bond, the Commission preparing to begin the official rulemaking process for the regulations that will govern how the money will be spent. The Commission’s program to distribute funding is formally known the Water Storage Investment Program. At the fall conference of the Association of California Water Agencies, Paula Landis, Executive Officer of the California Water Commission, briefed attendees on the details of the program. The statute states that the funding is for public benefits, and clearly defines what the state can pay for: ecosystem, water quality, flood control, emergency response, and recreation. The state can only fund 50% of a project, it can be only used to pay for the stated public benefits, and of the public benefits funded, 50% has to be for ecosystem. “So there are five public benefits that we will pay for, and one of them has a higher priority than the other four,” Ms. Landis noted. Projects have to provide improvements to the Delta or the tributaries to help restore the ecological health and improve water management. “This is a challenge for some projects that aren’t directly connected to the Delta, but it’s not impossible,” Ms. Landis acknowledged. The statute defines several types of eligible surface and groundwater projects that can be funded: those identified through CalFed with the exception of Shasta, regional storage projects, local storage projects, groundwater storage projects, groundwater contamination prevention or remediation projects, conjunctive use, and reservoir reoperation. Ms. Landis emphasized that these are the requirements that are laid out in the statute. “We didn’t make this up to make it hard for you; it was what we were given,” she said. Support the coequal goals of the Delta. Improve water supply reliability, increase local and regional water supply reliability. The Water Commission has been working on the regulations for nearly a year now with a great deal of input from the public as well as the stakeholder advisory committee. The regulations will be submitted officially go to the Office of Administrative Law that will start a process of finalizing the regulation that takes at most 12 months, although the Commission hopes they will become final before that. Information not covered in the regulations themselves will be covered in other documents; those documents include the goals and objectives and principles of the Commission which is the foundation for the program; the initial statement of reason which explains what went into developing the regulations; the application instructions, and the methodologies and data that can be used. There will also be explanatory documents for applicants and a technical appendix that describes the methodologies for conducting the analysis as opposed to evaluating projects, she said. Ms. Landis said that the Commission will be providing technical assistance. “We anticipate that every potential applicant in some point in the process will have somebody assigned to them to help them through the process and help them to be a successful as possible,” she said. Interested applicants with eligible projects should be formulating their projects to achieve local and regional supply reliability, maximize public benefits, consider ecosystem and water quality priorities, consider how their project benefits the ecological health in the Delta, identify the beneficiaries and pull together the funding, Ms. Landis. Discussion period highlights: What other options are there if my project won’t qualify? During the discussion period, a member of the audience pointed out that on the Central Coast, there are several districts who are not connected at all to the Delta but have serious storage issues and he expressed his concerns about these districts being able to provide a benefit to the Delta in order to get funding. ACWA’s Cindy Tuck noted that Chapter 8 was written this way because it was intended to provide storage for the coequal goals: storage for water supply reliability but also the ecosystem of the Delta. 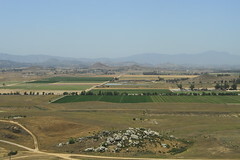 It was also pointed out that there are other chapters in the bond where storage projects without physical connections to the Delta can go for funding, such as the chapter on Integrated Regional Water Management; there are other chapters provide money for drinking water, cleaning up wastewater, for cleaning up groundwater, and for water recycling. The Upper San Joaquin Storage Investigation, more commonly known as Temperance Flat, is one of the Cal-Fed projects called out in the legislation. This project proposes to build a 1.3 MAF reservoir in the upper end of 520,000 acre-foot Millerton Lake, which is located on the San Joaquin River near Fresno. With an average inflow of 1.8 MAF, Millerton Lake is considered small for the watershed and must release on average 450,000 acre-feet for flood control purposes. The project is projected to yield approximately 96,000 AF of annual water supply and 121,000 AF in dry and critical years. Potential public benefits include enhancing cold water for the salmon below Friant Dam, additional water for flow management for fisheries, more reliability for river restoration program, and providing flood protection benefits. One downside is that the project would inundate two power plants and reduce power production at others. Friant contractors are still considering participation in the project. Local counties have formed a JPA to be the applicant under the Water Commission process. Los Vaqueros Reservoir is owned and operated by the Contra Costa Water District (CCWD). It is not physically located in the Delta, but it located up the hill, close to the export pumps, Old River and Middle River. Los Vaqueros was built and is managed to improve water quality for CCWD customers; it also provides emergency water supplies. The reservoir was first constructed and completed in 1998, paid for by voter-approved bonds and was built only to serve CCWD customers initially. The reservoir was expanded to 160,000 acre-feet in 2012. The expansion of the Los Vaqueros Reservoir to 275,000 acre-feet is one of the Cal-Fed projects specifically named as eligible under the legislation. If built, the expanded reservoir would serve other Bay Area agencies in the vicinity. The Tulare Lake project is being led by Semitropic Water District and is still in the conceptual stages. SWD is looking at building between 70,000-120,000 acre-feet of storage facilities in the historic Tulare Lake lake bottom; these would be primarily low berm levees and shallow facilities and are meant to be short-term facilities. They would primarily capture flood water off of the Kings or other tributaries to the Tulare Lake bed to use for local benefit. The concept is to reregulate the water back into groundwater storage projects that are currently operated within the Semitropic Water Storage District. The project would integrate with the state water system by being able to used stored water from the bank rather than pumping from the Delta when water is needed in Delta for environmental or ecosystem purposes. The project is just in the feasibility stage right now. Public benefits include flood management, additional flooded acres for habitat in Pacific Flyway, operational flexibility to capture water and store for use in later years when water is needed in the Delta, and integration with other state water systems. Sites Reservoir, one of the Cal-Fed projects, is a 1.3 to 1.8 MAF reservoir proposed for the west side of the Sacramento Valley. The reservoir would be off-stream; winter and spring runoff would be captured and conveyed through existing canals and pumped into the reservoir; it would be returned to the Sacramento River via a pipeline. The project is projected to produce between 450,000-500,000 acre-feet per year; half would be for public benefit and the other half for water users, both in the Sacramento Valley and San Joaquin Valley. With construction costs estimated at around $4 billion dollars, water costs would be about $600 per acre-foot. Primarily public benefits include cold water pool carryover in Shasta, Oroville, and Folsom, and salinity repulsion as emergency response in the Delta. Click here for the Water Storage Investment Program page at the California Water Commission. This investment should be heavy on restoration of the water basin first, rather than spending billions on evaporative surface water storage facilities that take water from other sources that very likely restore aquifers.